2. Cook brown rice according to package directions, omitting salt; set aside. Meanwhile, thread shrimp onto 4 metal skewers, leaving 1/8-inch space between shrimp. In small bowl stir together barbecue sauce and ginger. Grill shrimp on greased rack of uncovered grill directly over medium heat for 6 to 7 minutes or until shrimp are opaque, turning once and brushing frequently with sauce mixture. Stir mango, onion, cilantro, jalapeño, and lime juice into hot rice. Spoon onto serving plates. 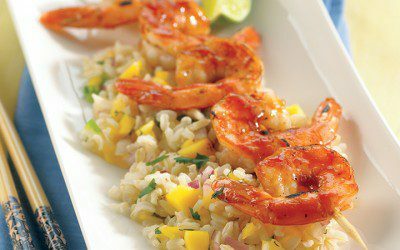 Serve shrimp on top of rice mixture. Note: Mangos are chock-full of vitamins A and C. They also are rich in fiber and contain over 20 different vitamins and minerals. **Note: To chop a mango, first cut off all four sides around the pit. Then slide a knife between the skin and meat of the mango. Remove skin and cut into chunks then chop into smaller pieces. *Note: Jalapeño peppers can sting and irritate the skin, so wear rubber gloves when handling peppers and do not touch your eyes. Serving size: 1/2 cup rice and 5 shrimp. Exchanges per serving: 2 Bread/Starch, 1 Meat.